Derek Berg and Josh Immordino competed last week in the 35th Callaway Golf PGA Assistant Championship at the PGA Golf Club in Port St. Lucie. After round one on November 3rd, Immordino was tied for 47th place with a +1 score of 73. He scored 78 on round two. After round two on November 4th, Berg is tied for 41st place with scores of 72-74. He made the cut to the next round. His round three and round four scores were 74-69, leaving him tied for 16th place after the final round with a score of 288. Congratulations Derek! The National Champion will receive $9,000 from a total purse of $100,000, and a berth in the 2012 PGA Professional National Championship, to be played next June at Bayonet and Black Horse in Seaside, Calif. The top 10 finishers and ties earn a berth into the first stage of the 2012 PGA Tour Qualifying School. 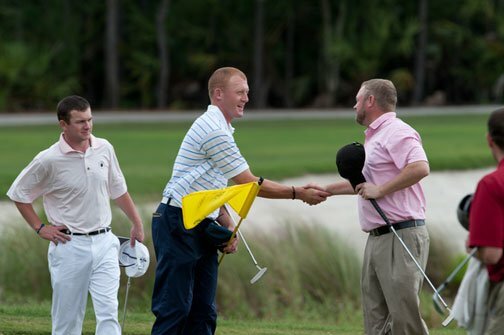 In addition, the top 4 finishers and ties earn berths in the 2012 PGA Assistant Championship. Click here for complete scores.